I do love me the “blackened” seasoning on almost anything… shrimp, burgers and now chicken. Take these chicken strips and dip in a moutard / mustard dip, and I’m in heaven! If you sprinkle it lightly on chicken, you’ll get a great Cajun seasoning, but if you really layer it on, you get the blackened effect… my favorite! The heat level in this rub is medium to medium-hot. The more you use, the hotter it will be. And it’s a super clean tasting, delicous heat. It doesn’t burn my mouth so much as it makes my head sweat. Quality heat, folks! Just a great product. Todd’s Dirt Bayou is also great on french fries. You will love it. If you have a Five Guys Burgers and Fries near you, they use a lesser quality cajun seasoning on their fries… trust me, Todd’s is superior. As a matter of fact, the label says it’s “good on Steak, Beef, Pork, Chicken, Fish, Seafood, Chili, Ribs, Vegetables and more”. It also says “use the Bayou Dirt as a rub when you are grilling or Barbecuing”. 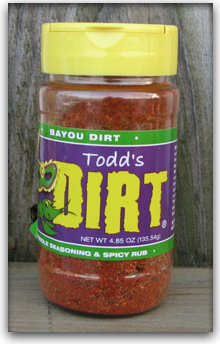 I’m going to order more of the Bayou Dirt, as well as Todd’s other seasonings – the original and Crabby. Can’t wait to try those! 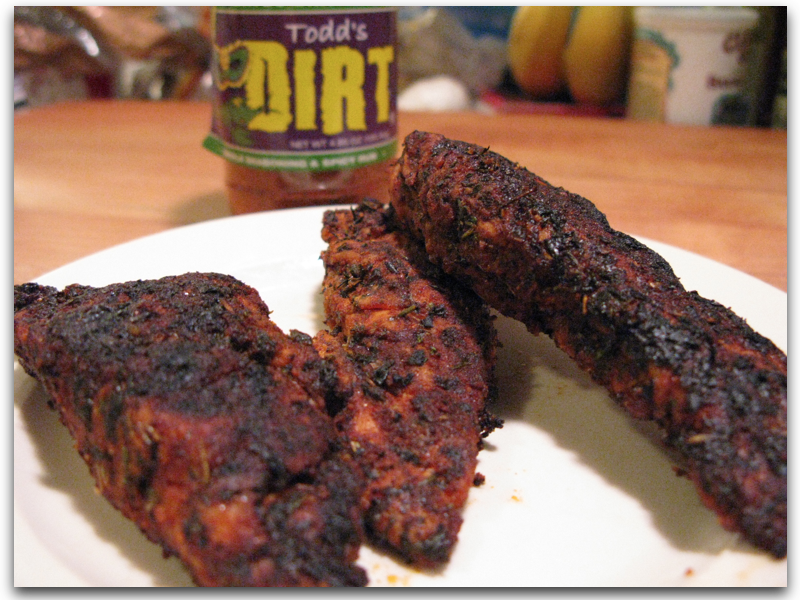 Visit ToddsDirt.com and buy some of Todd’s Dirt Original, Crabby, and Bayou seasonings. Use Coupon Code: DIRTY to get 15% off your order! and tell them HotSauceDaily sent you! I love Todd’s Bayou Dirt Seasoning on everything you can imagine. Try them on eggs! in stews, on fries! It is the absolute best creole seasoning on the market right now! Hey Juan… thanks for the endorsement! It really does rock! That stuff really does look like dirt, but i bet it has a great hot sauce flavor. That sells me. I will definitely be buying some of this and some of the standard Dirt soon. Everyone on the BBQ Brethren swears by the regular Todd’s Dirt and I just haven’t gotten around to ordering it online. Man I wish more rubs were available retail but I understand the limited market. Brian, I could not of written this any better. The picture of the blacken chicken looks great. I know how good that taste. I really appreciate the great detailed review. I spent a long time trying to get this seasoning/rub just right. Bold flavor, with not too much salt and the right amount of heat. For anybody who would like to try it. Hear is a discount for you. Type in DIRTY when ordering to get 15% off your entire order. Brian thanks again. Todd… You da man! Your stuff is awesome. Stay tuned for more comments. Todd, I did indeed take advantage of your Coupon Code “DIRTY” and ordered all the Dirts you have plus your cookbook. Woot! this stuff is really good and it is good it you put cream cheese and mix it togeaether……. Great idea that we’ve not tried yet. Thanks Alyssa.